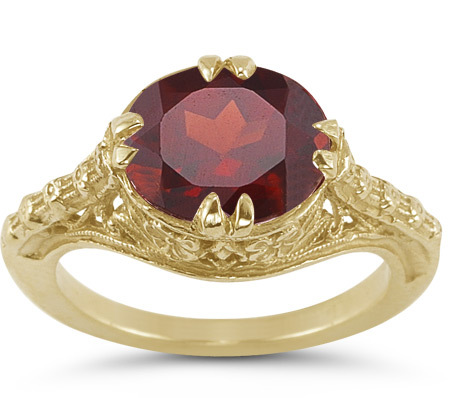 Created with jewelry making pieces that the original was made from back in the 1800s, this vintage red-rose garnet oval ring in 14K yellow gold from Apples of Gold Jewelry offers a taste of the past. The beautiful crimson, rose colored oval garnet gemstone is AA rated and measures 10mm x 8mm, which makes it a perfect size for every occasion wear. The 14K yellow gold ring has a beautiful filigree design that showcases plenty of detail and makes the ring a favorite design. We guarantee our 1800s Vintage Red-Rose Garnet Oval Ring in 14K Yellow Gold to be high quality, authentic jewelry, as described above.